For comfort you can trust, turn to the Dansko Walker oxford. 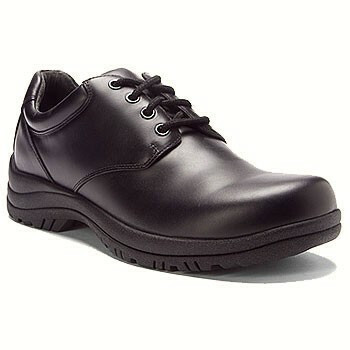 Part of the Walden Collection, this casual men's lace-up shoe combines a clog base with state-of-the-art materials for an especially comfortable fit and feel. The waterproof leather upper makes the Walker clog perfect for occupational wear; a removable, triple-density insole offers long-lasting comfort. The riveted shank provides arch support, while reverse coring holes absorb shock in the heel. Strobel construction ensures flexibility with every step. A slip-resistant rubber outsole finishes the Dansko Walker shoe with dependable traction and stability.